Press and Awards — Casgan, Inc. They knew they wanted a home theater. They just didn't know what kind of home theater they wanted. That was until they visited a home in Thousand Oaks Calif., where one husband and wife found out what it means to be inspired. Custom electronics pro Twilight Sounds brings a San Francisco-area homeowner reluctantly into the 21st century, as slickly as possible. 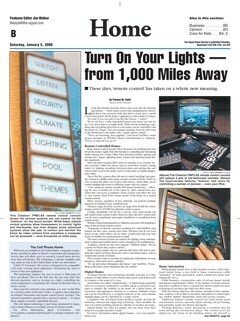 These days, 'remote control' has taken on a whole new meaning. 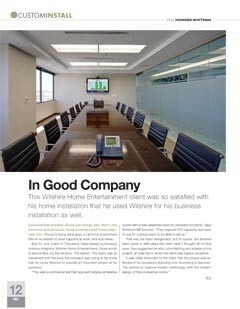 This Wilshire Home Entertainment client was so satisfied with his home installation that he used Wilshire for his business installation as well. Walnut Creek, CA-based integrator from designing and installing a system that delivered everything this discerning homeowner asked for, and more.